2018 will be remembered as a special year for the Trades Union Congress (TUC). Besides celebrating its 150th anniversary, the British trade union centre also embraced the Fair Transport Europe campaign at its annual Congress. Held in Manchester, 9-12 September, the TUC Congress decided on the priorities of the British trade union movement for the coming year. As part of the agenda, Nautilus International asked Congress to adopt a motion on Fair Transport. The motion welcomes the Fair Transport Campaign and “expresses full support” for initiatives that seek to “eradicate social dumping and secure decent work and quality services in all forms of transport”. It states that “many workers in the European transport sector are exposed to extraordinary levels of exploitation, social dumping and unfair competition, which undermine their job security, pay and conditions”. The motion also notes that “transport workers often experience excessive working hours, stress, fatigue and substandard working conditions”. 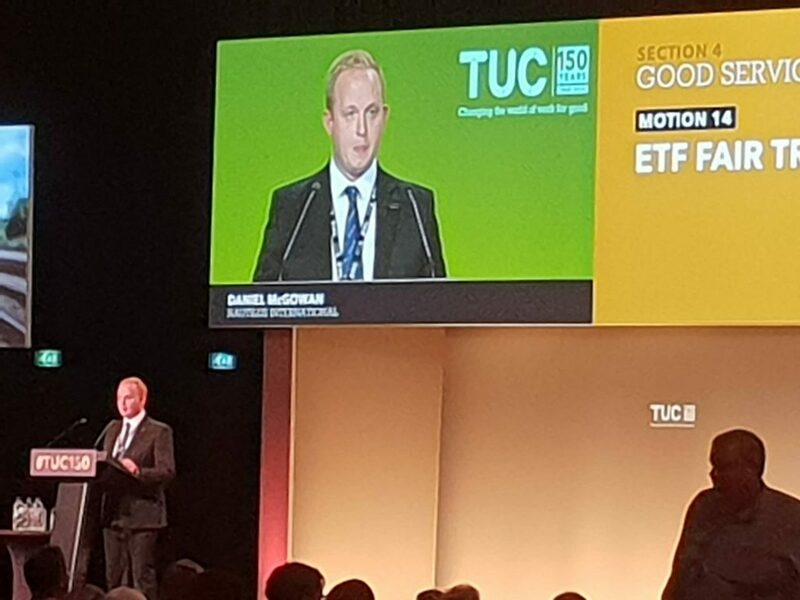 Nautilus delegate Danny McGowan urged the TUC to give full support to the Fair Shipping element of the Fair Transport campaign, which seeks to create a European maritime space without social dumping and decent terms and conditions for all crew. In a supporting article, published on 11 September, Nautilus General Secretary Mark Dickenson underscored that “more than 90 per cent of our food, fuel and everyday items comes here by sea. In an international industry like shipping, it is vital that we have effective trans-boundary regulation to prevent widescale abuse of a highly mobile workforce like seafarers”.